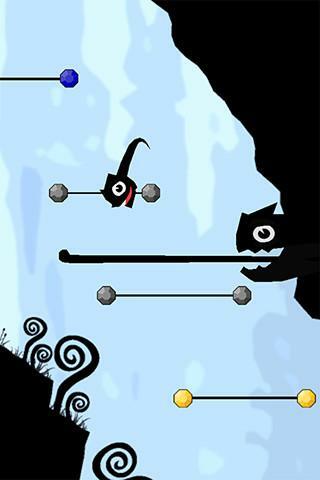 Published by Games2Be, Spoingis fun trampoline platform title for all ages. 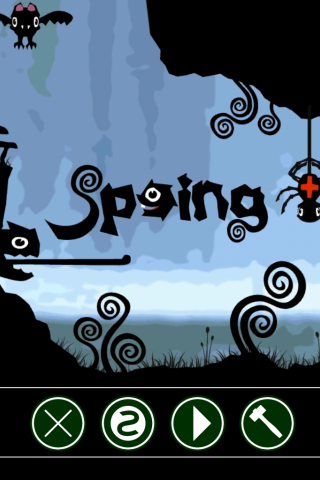 Spoing is a cute little character who has had his diamonds stolen. He needs to be guided through 50 levels using trampolines to sling shot him across each stage to collect his diamonds. Be careful and pay attention to avoid enemies and falling rocks which will send Spoing right back to the check point and destroy your best time for the stage. We begin the game with Spoing explaining how his rainbow diamonds have been stolen and start his journey to get them back. This is a simple storyline and gets you into the game quickly. The first level starts off well and eases you into the game by maneuvering the the character through the level using a ‘slinging’ method. A lot of games use a ‘slinging’ method these days, a game mechanic made popular by Angry Birds – so Spoing is very easy to become familiar with which makes the game playable right from the beginning. 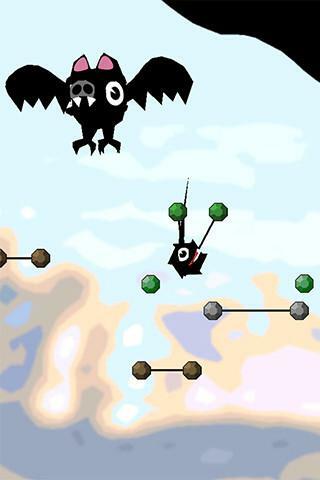 The game play is incredibly smooth, from the moment you begin to shoot creature until the second it lands back on the trampolines, the physics are seamless. This adds an incredible element to Spoing and makes it a pleasure to play and just to watch the ball in motion. The touch pickup is very responsive and there isn’t an ounce of lag between when the user touches the screen and when you release. This makes it very easy to interact with the Android game and enhances Spoing’s playability immensely. 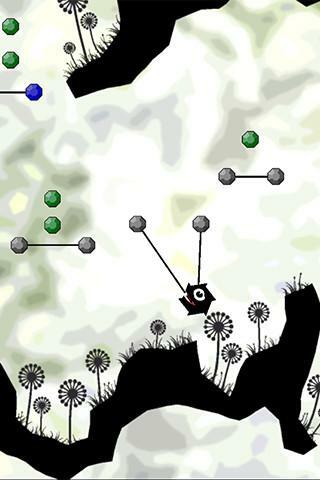 As you transition through the levels the difficulty and length of each level grows very steadily. It eases you into the game and as you build your skills and familiarity with the game it feels as if the game grows with you. When guiding Spoing through the levels there are guide lines which assist to determine the trajectory. This is helpful when you get further into the game and need to build your own platform from green diamonds to help bridge the gap between vastly separated trampolines. Overall this is a very well rounded Android game, the graphics, music and playability are all very polished. Spoing won’t be challenging you to reach the peaks of your gaming ability but the graphics and various level designs will keep you playing right through to the end. The only two frustrating things which came to light were the back button closed the app even when in the actual game, my wandering fingers often hit the back button but without a confirmation to prevent closing the app this can be annoying. The other thing was the main menu has the ‘exit’ button as the first button when looking from left to right. There is nothing wrong with this but generally this is on the left and I admit I pressed it a few times before realizing even though it was labelled with a big ‘X’. Aside from these small things Spoingis a great Android game.